Rain disrupted the football programme once again as rain showers overnight and through Saturday waterlogged more pitches. Louth Old Boys’ trip to Cleethorpes Town A in Division One of the East Lincs Combination was rained off for the fourth postponement in their last six fixtures. The Tom Sandys Cup tie involving Louth Old Boys Red at home to Sutton Rovers Reserves also fell victim to the weather, while AFC Louth were forced to concede their Junior Challenge Cup tie at Immingham Town reserves. But in Division Three, Mablethorpe Sports Athletic enjoyed a positive day as they chalked up their fourth league win of the season at home to Burgh Athletic. A Ryan Parnell double put them 2-0 up at half-time, and the forward went on to complete his hat-trick in the second half to wrap up a 3-0 win. The three points leaves Mablethorpe in eighth place, but just a few points off the top six. 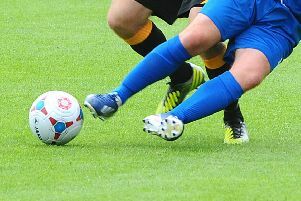 But Alford Town Second XI’s miserable season continued with a 5-1 defeat at third-placed Susie Star. Oliver Willett got Alford’s consolation. Division One: Louth Old Boys v Sutton Rovers. Division Three: Sutton Rovers Res v Louth Old Boys Vets. Tom Sandys Cup: Alford Town Second XI v Louth Old Boys Reds. Tim Sales Charity Cup (1.45pm): Mablethorpe Athletic Sports v Grimsby Borough Dev A.
Cusworth Cup (1.45pm): AFC Louth v North Thoresby.